The career line also referred to as the fate line or Saturn line is an excellent indicator of change in the life of its bearer. Which is why it is a valuable indicator of the transformation and success of its owner. A perfect and straight fate line which runs directly from the base of the palm to below the finger of Saturn can denote an unchanging and steady career or direction in life. The person knows who they are; they are self-motivated, serious and in control of their decided path in life from an early age. Starting at the life line is a traditional start to a career, which originated from the individual’s background, education or personal merit. It represents a competent person who is determined to apply their energy and talent to succeed in life. Starting from inside the life line would show someone who has had less choice and was probably ruled by family in the line of work expected of them or obligated to follow the same profession as their parents. Starting at the wrist at the centre of the hand shows first responsibilities and a balanced personality. 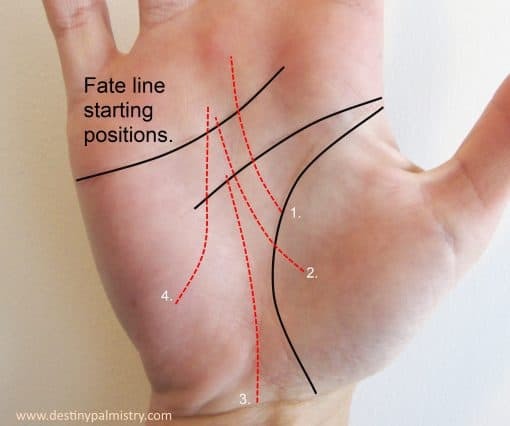 The fate line starting at the base of the palm is a sign of common sense and independence using own efforts which can manifest in the choices of career. A fate line starting at the Mount of Moon shows people (or public) based profession of their choosing. They achieve success due to their appealing and essential qualities, someone who can be in the public eye. Often found on entertainers and actors. Palm reading – Are you seeking meaningful self-awareness and new clarity about your life? Did you know that through a thorough hand reading, you can achieve a complete change in how you feel about yourself? A life mission reading from your fingerprints, combined with features from the hands, will reveal a KEY THEME of your life, your strengths and what you need to know to use your full potential. We all have a calling or purpose in life; it is our passion in pursuit of a dream. Your life mission reveals your power that will propel you towards that goal. Scientifically based information from the fingerprints will help you get a clear direction in your life from your strengths and explain your life lessons, your weaknesses that are holding you back and why you keep struggling in some areas of your life? Will I succeed in your career? What is your right direction in life? What lucky signs do you have, like the line of success? Do you have what it takes to succeed? Trial palm reading.